At last! A single-cable solution for your A/V set up! Save on cable costs and bring order to that maze of A/V cabling with StarTech.com's HDMI to DVI video cables. 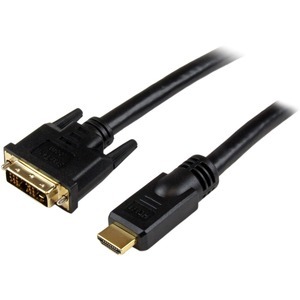 This cable is designed to connect devices with a DVI connector to displays with HDMI inputs. These cables connect easily to your LCD TV, LCD Projector, Plasma TV, HDTV, DVD Player or set-top box.